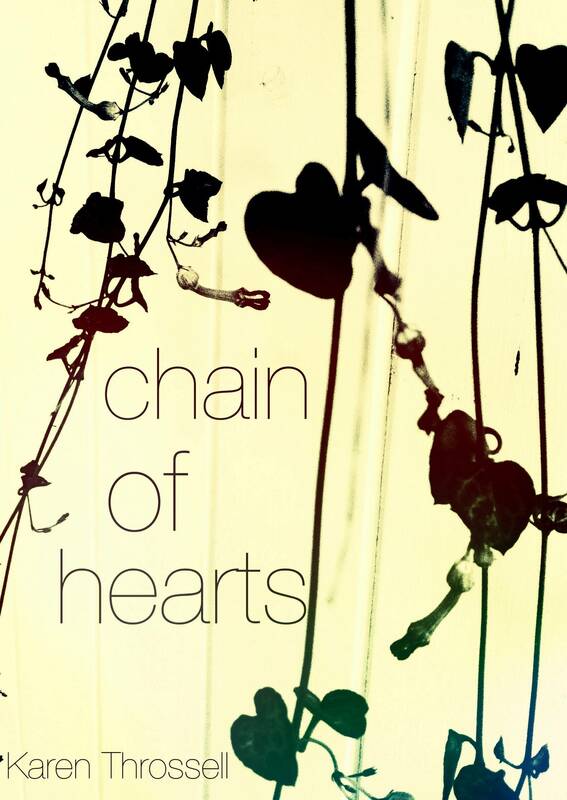 Chain of Hearts, poems by Karen Throssell (Ginninderra Press, 2012). This is a slightly edited version of the John Jenkins’ launch speech for Karen Throssell’s third book Chain of Hearts. The launch took place at Collected Works on 18th August 2012. It’s a pleasure to launch Chain of Hearts, the third book of poems by my friend, neighbour and fellow writer Karen Throssell. These are poems marked by their clarity, intimacy of tone and directness of address. As a poet, Karen takes you into her confidence, and the poems unfold in a natural and sympathetic way. Some poems are highly personal and emotionally edgy, yet their intensity is counter-balanced by a familiar and conversational style. Karen’s egalitarianism is always a given. Her poems are addressed at ‘eye-level’, and at first-person-pronoun-I-level, too… as if to a friend. To me, this is, one of the most engaging qualities of this book. The poet has (at least, for the most part) an uncomplicated and pragmatic approach to the English language and its endlessly rich resources. sucked deep by roaring tides. Buildings the colour of sky. blurring us into blank-faced crowd. gleaming out from all that grey. in clouds of smoke and smugly pass the time. For the past 20 years Karen has managed Warrandyte Neighbourhood House, which co-ordinates teaching courses in the community. (Warrandyte is a Yarra River suburb 24 km north-east of Melbourne). Karen also organises the annual ‘Grand Read’ in Warrandyte – a showcase of local writing talent. She is one of those absolutely essential people who spread a lot of sunshine into their corner of the world, and is a champion of localism. Karen seems to have found an agreeable niche in her river town of Warrandyte: “I think that it’s got me / this sleepy dream town… // Me, the girl from Fitzroy / came here on a whim…” // Now I am here, / the river’s turned bossy, says Never Again! / to Best Practice meetings / and work-till-you-drop.” (from ‘River Town’). Karen has been writing poetry for about 15 years, though non-fiction for a lot longer – and an important poetic mentor was the multi-talented writer and teacher Anne Edgeworth, in Canberra. Early influences included political poets such as Neruda. Karen, as some of you may know, has spent a lifetime in left politics, with a focus on social-justice, advocacy and equity. Particularly in this book, poetry and biography coincide. Karen’s father, Ric Throssell, was a career diplomat, posted overseas, and Karen spent her first four years in Brazil. Then her family returned to Canberra, where Karen’s academic path began, first at the ANU, then Sydney Uni, then Adelaide Uni for her Masters in politics; then La Trobe. Karen has worked as an academic, both in universities and TAFE; and in the late 1970s for the Labour Resource (and Research) Centre, taking part in work projects for Victorian unions. In the Victorian Cain labour years, she was an equal opportunities officer, across many industries and challenges, which included helping female motor mechanics further their careers. Her first non-fiction book, a history of Australian foreign policy, was published in 1988; titled The Pursuit of Happiness: Australia, “the Empire”, ANZUS, nuclear disarmament and neutrality. Her second non-fiction title, Taking Back Time: How Part-Time Work Will Revolutionize Your Life is now doing the rounds of publishers, and we wish it a good landing. Karen’s trajectory of commitment, whether directly or implicitly, finds wide and various expression in Chain of Hearts. Recently, Karen has campaigned against gambling addiction, and more specifically, against investments in poker machines by Australia’s two supermarket giants. As several poems attest, it is not a disinterested campaign, as Karen and her family have been touched personally by this problem. In a previous rocky campaign, Karen was threatened with legal action by ‘the Big Mac’ itself, after a pamphlet was written by Karen and several others, titled ‘Rip-off Ronald: How McDonalds is Exploiting our Kids”. on a shade of green. with a white fur collar. Finally, we come to family matters, often a highly personal (and powerfully expressed) arena, of both solace and distress, in Chain of Hearts. And where the biographical elements are most strongly linked to the poetic. Some of these family poems register shocks to the soul, as only the surprise loss of loved ones can detonate. Others take us into the harrowing territory of serious illness and the personal grief that surrounds it.Yet, despite the difficulties illuminated in this book, it remains an essay in quiet hope. A long and extraordinary literary legacy within Karen’s family is also traced here, which might have began with Karen’s great grandfather – who was once editor of The Fiji Times and, later, of the Melbourne Sun. Then followed Karen’s grand-mother, Katherine Susannah Prichard … author of 13 novels, as well as plays, journalism and verse – who declared she was, “born with ink in my veins…” Katherine Susannah Prichard, famously, was also a foundation member of The Communist Party of Australia. So much of that ink is red! The ink kept steadily flowing, and down through the entire family.Karen’s father, Ric Throssell – as well as being a career diplomat – was author of 26 plays, as well as non-fiction titles.In the 1950s, Ric Throssell became victim of the hysteria and paranoia of the Cold War. And Karen is currently completing a play, titled The Man Who Wasn’t There, about that crazy era, and her father’s long fight for justice, after he became swept up in the infamous Petrov Affair and was falsely accused of being a spy. More recently, the family ink seems to be fuelling the pens of Karen’s two daughters, Bryony and Katie.Bryony won the FAW junior poetry award when she was 16… And her attractive cover artwork is on Chain of Hearts.Katie, meanwhile, now lives in France, and translates extensively between English and French; mainly academic work so far, but lately gravitating towards the literary memoir in her own writing. I will read perhaps the gentlest of Karen’s family series, about a CD of music once given to her sick mother. Titled The Final Indulgence. It is also, wonderfully, a poem about music itself. Pate winter sun stroking her bedspread. but now gathered around her bed. a slide into fathomless grief. the last of rose, all summers. To end on a very happy note, it’s not every author who has a new book – and becomes a proud grandmother! – in the same year. Katie and her husband, Gowan, live and work in Chartres, France, where six months ago, their first son, Sasha, was born, so the chain of hearts continues unbroken, and with gathering strength. It’s a little too early for Sasha to pick up a pen, so we will have to wait for that … In the meantime, we have Chain of Hearts to read… which I now declare launched! John Jenkins lived with Carol Novack in Sydney in the mid 1970s, when he first met many uniquely creative people, including Rae Jones. He is a sometimes visitor to Rochford Street, though now lives near the outer Melbourne suburb of Warrandyte, where Karen Throssell continues her writing and community-building work. His most recent poetry books are Growing Up With Mr Menzies (John Leonard Press, 2008) and (with Ken Bolton) Lucky for Some (Little Esther, 2012). This entry was posted in Chain of Hearts, Ginninderra Press, Issue 5, John Jenkins, Karen Throssell and tagged Anne Edgeworth, ANZUS, “the Empire”, Collected Works, Katherine Susannah Prichard, nuclear disarmament and neutrality, Ric Throssell, Taking Back Time: How Part-Time Work Will Revolutionize Your Life, The Communist Party of Australia, The Man Who Wasn’t There, The Pursuit of Happiness: Australia, Warrandyte Neighbourhood House by Mark Roberts. Bookmark the permalink. I can imagine John’s voice wrapped around these elegant poems. Well launched.